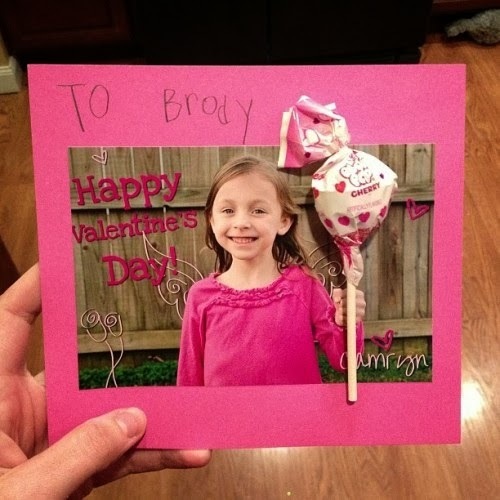 Photo Credit: Valentines card photos belong to their respective owners. All valentines cards are linked from the photographs, click on a photo to visit the creators blog and view the card. Valentine’s Day is right around the corner. 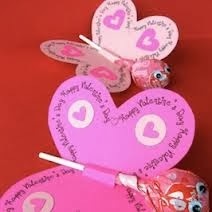 I am sure that the boxes of Valentine cards on display have caught the attention of your kids. My son isn’t in school yet, but somehow he has managed to talk his father into buying a box of Mickey Mouse cards, and he convinced me to buy a box of Cat in the Hat cards. While these are cute and will certainly be put to use at some time, they don’t meet our needs for spreading the love to his favorite people. I have been searching pinterest for cute ideas for cards that kids can make and I found so many fantastic and creative ideas that I can’t decide which ones to create this year. I love that these cards are personal and that the sucker is strategically included to look like the child is holding it. If your little boy loves Super Hero’s then this is the card for him! 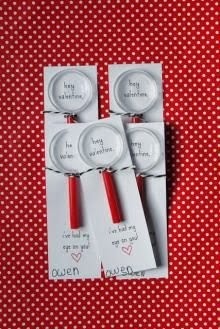 I love this idea, a magnifying glass can inspire so much creativity in children! If you have celery, paint and paper you have the means to make gorgeous and creative cards . The beauty of this sucker card lies in the simplicity. 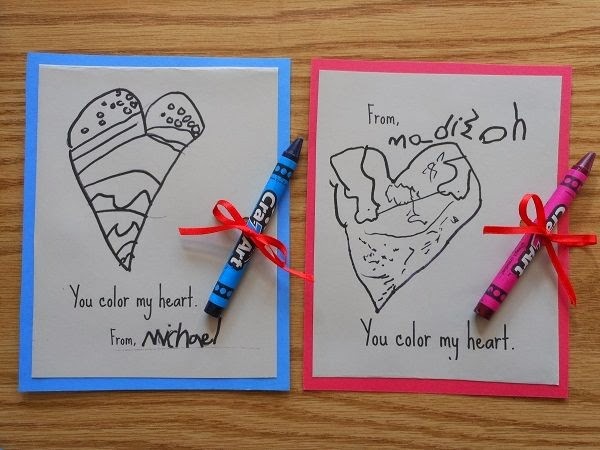 How cute are these You Color My Heart Cards? We have a bucket full of broken crayons that I have been saving for a project like these crayon cards. 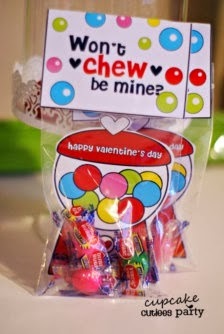 Aww, this cute idea gives me butterflies in my tummy. This idea is perfect! 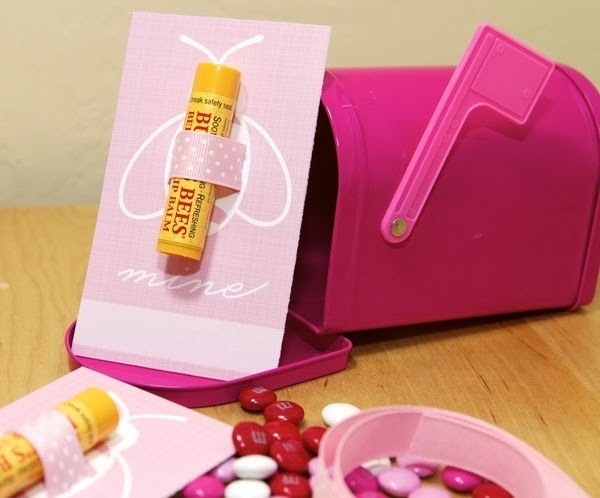 Everyone needs a little Burt’s Bees for their lips at this time of year. 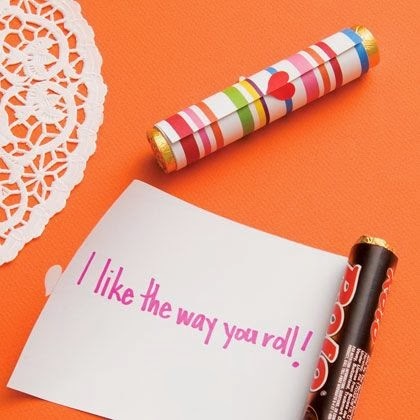 I love the way you roll when you make a Valentine scroll. Kids love goldfish and parents will love that you didn’t send more sweets home with their most likely already sugared up child. 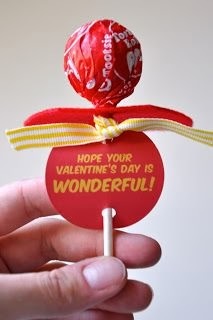 I love this healthy alternative to Valentine’s Treats with a sweet message. 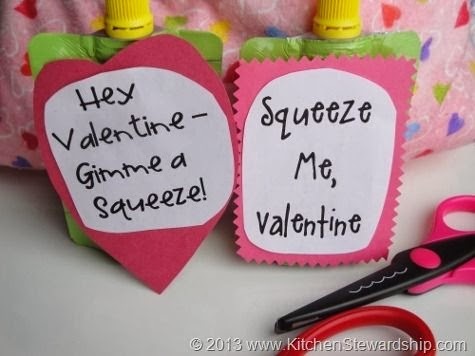 I am thinking of doing this with yogurt pouches for my husbands classroom. 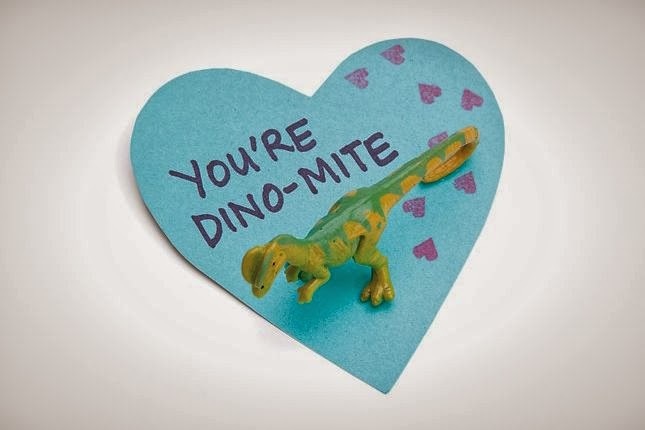 My son would love to receive a card like this, he is Dinosaur obsessed! 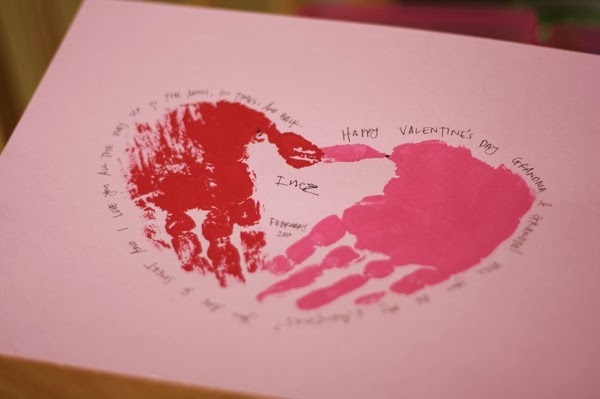 This is a great idea, not only will the kids have fun painting their hands to make these cards, but these would be perfect for giving to loved ones as well as friends. This Bubble Gum card is sure to be a hit with the kids! 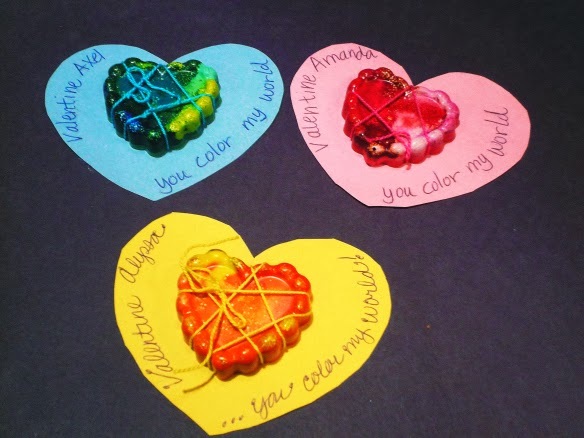 I hope this round up gives you some ideas for great Valentine’s Day cards to make with your kids! These are SO cute! My daughter would love the one with the Go Go Squeeze!! 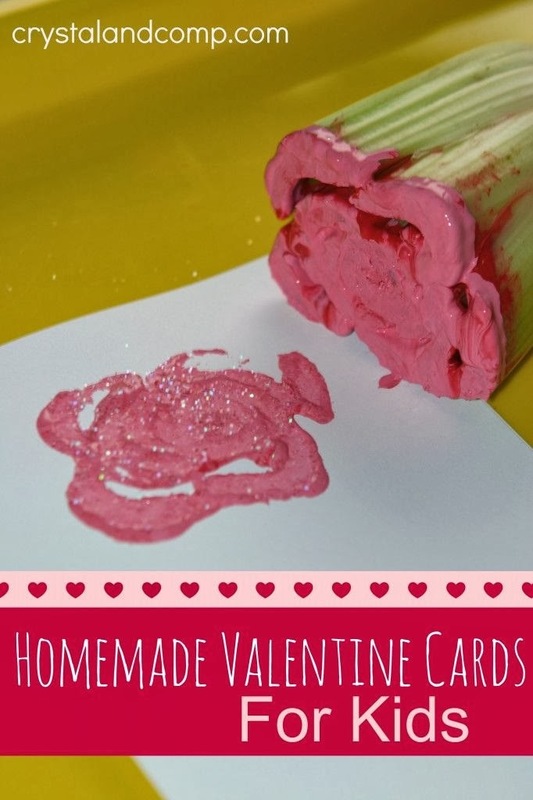 Thanks for including our celery stamp Valentine cards! 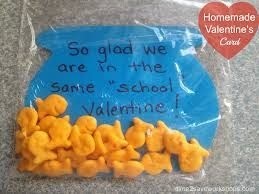 so many cute valentines ideas. Thanks. Thanks for linking up at Tell Me About It Tuesday. We hope you hop over and share with us again next week. 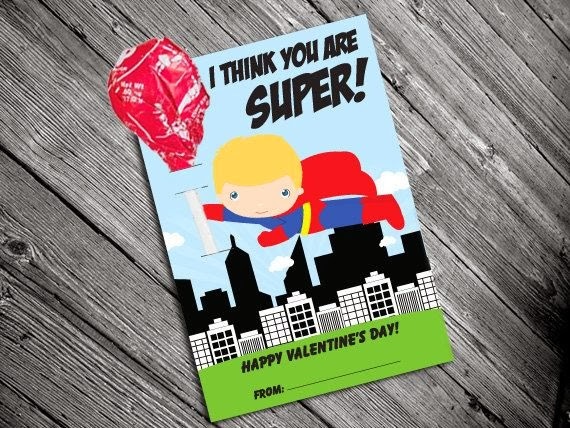 Thanks so much for including the super hero valentines! Love your blog!